June 6, 1948: The newly-minted SHIELD tries to solve a rash of missing persons cases. Fifteen. That's how many people have gone missing without a trace over the last two weeks. That's just the ones they know of. That's just the ones with friends and family in the area to report them missing. Who knows how many homeless - how many wide-eyed midwesterners with no family and friends - have also disappeared? There seems to be no pattern. All ages, races, economic backgrounds have disappeared. There's only been one connecting thread - a strange green substance and odd dimensional energy. Howard hasn't been able to make any sense of the green substance and that frustrates the everloving hell out of him. It does not conform to any known chemical properties. According to his analysis, it just plain should not exist. They've had more luck with the energy signatures, though. Thanks to a contraption attached to the roof of a car, they've been able to take readings all over the city. Ten minutes ago, they got a fix on it in the Lower East Side, in a tenement complex known for crime and gang activity. "Hoo boy," says Howard to the other occupants of the car as he checks the readings. "Of course, we couldn't have gotten a reading on Broadway. Best call out the backup, kids. I have an address. Stanton and Clinton." While Howard has been analyzing the green substance, Peggy Carter has been the one tracking down clues that have less to do with dimensional energy. Talking to friends and family in an attempt to figure out if there is any sort of connection between the missing people. While there does not seem to be one on the surface, there has to be a reason these people were chosen out of the millions of people who live in New York City. Even as Howard is telling them to call in back up, Peggy is on the radio. "This is Agent Carter, we have a fix at Suffolk and Clinton, requesting back up for case number 00013." She shouldn't have to tell her agents that the neighborhood is dangerous. They're government investigation agents, they can figure that out on their own. "If we'll be dealing with both the local flavor as well as your green ooze kidnapper, perhaps we should expect the police to also be here." She glances at Howard, with a pointed look. "If so, then I think it best that I do the talking." The last thing they need is a fight with the police because of Howard's inability to play nicely with others. He doesn't look deeply thrilled at the notion of the Lower East Side, but that doesn't stop him from navigating the car that way. "Shall I remain with the vehicle?" Primarily to ensure that it's still there when they get back? It figures it would be this part of town, or so thinks detective Frank Nelson, NYPD, riding "shotgun" in the unmarked car that follows in the wake of the lead, tracking car. He's not so sure about these…SHIELD people, but orders is orders, and his orders is to cooperate as best he can with them. It helps that there's veterans among them, and as he looks over the agents in the car with him, he has to admit they at least look like they can handle themselves. He glances at the radio as Peggy's voice comes over it and cna't help but grin a bit. Yeah, he'd follow her even to Stanton and Clinton. He absently checks his revolver as they take a turn. Rachel was no stranger to time travel, having spent years of her life being flung to all manner of strange futures, alternate timelines and alien worlds. The 1940s however was a strange place to her, something she had only read about in history text books. For the past few days she had been doing her best to fit in and figure out exactly why she was here. The strange disappearances and mysterious substance had piqued her interest, using her powers she had been conducting her own investigation with little luck in finding answers; at least she had avoided contact with the authorities in this time period so far. Having altered her clothing into a black 1940s style sweater dress with stockings and heels, she at least looked like just another woman from this time period. Feeling nauseous the closer she gets to Stanton and Clinton, she leans against the wall of a building near the tenement complex and grabs her head with her free hand. Whatever these disturbances were, they had taken her powers from her as well. "This isn't good." Rachel muttered under her breath. "Hell, I intend on remaining with the vehicle. I'm not much of a shot, truth be told," says Howard as he fiddles with the dials on the device in his lap. "The readings are slowly increasing. I think we're leading up to an event rather than in the aftermath of one. That's the good news. Bad news…." he says as they pull up to the building. He cranes his neck upwards. "I don't know what floor we're talking about." The building has seen better days. There's garbage on the curb and people in less than…stellar clothing. The shiny cars get looks from the residents. A few toughs give them the eye. "Uh. On second thought. It might not be any safer out here." "If they're going to take the car, they're going to take the car. I'm not quite sure what the two of you intend to do against a gang of men intent on grand larceny in front of armed police officers." As the car pulls up to the building, Peggy is quick to step out, taking out her gun and readying it just in case. It never hurts to be prepared. "And unless you can take your readings from the street, it may be best for you to come with me." Her eyes immediately are scanning the sidewalks, taking in the toughs that spook Howard as well as Rachel leaning against one of the buildings. The woman may be there to lure a concerned citizen close enough to rob, but then again, she may just be exactly what she appears: a woman who needs assistance. "Perhaps, Mr. Jarvis, you might inquire if anyone has seen anything strange lately?" She inclines her head toward Rachel with an eyebrow raised, silently asking him to check on her. As the police arrive, she's quick to establish herself as the lead. It's all business with Peggy when she's in the field. "Thank you for coming, detectives. The disturbance is somewhere in this building, but we're not exactly sure the floor. Teams should check each floor, keeping in radio contact. If anyone notices anything suspicious, it should be called in. Are we clear?" "It's not exactly that I'm deeply attached to the vehicle, Miss Carter. It's a bit more that I'm not terribly inclined to walk home from here." But orders are orders, and Jarvis sees about finding an alley to park in. Backup is coming, isn't it? Backup sounds marvelous. More men with guns — correction, more SHIELD agents with guns — are always welcome. When Peggy points out that he ought to go around chatting to the locals, he looks around at her as though suspecting she's completely lost her mind. It's only when she points out Rachel that he understands; nodding his assent, he pulls over, parks, and steps out. Buttoning his jacket and putting on his hat, he looks every inch the gentleman. Possibly the gentleman nervous about talking to anyone out here. Backup arriving is welcome as well, and as Jarvis strides toward Rachel, he tries not to be obvious in glancing back at the others to ensure they're all still quite all right. Not the best neighborhood. Det. Nelson knows the look of the locals, and especially the toughs. He's careful to let his suit coat flap open a bit as he exits the car, revealing the gun he's carrying, though not the badge. He wants the local toughs to know these are not folks to be trifled with. They're not out-of-towners who got lost seeing the sights. It's weird, taking orders from a dame, but she sounds and acts like she knows her business, and that counts for a lot. Nelson touches the brim of his fedora in acknowledgement and then turns to the others. "You heard her, boys. Two by two, but eyes open. This ain't no ark and that ain't Noah in there. You see something, call it out. Remember, do it to them before they do it to you." Rachel takes a deep breath and shakes her head, feeling like she just got hit by a train. She had hoped to get in the building before anyone else and now, the G-Men were here, great. Still rubbing her forehead with one hand she turns away from the wall, only to see Jarvis heading towards her. "Hey hey now, don't be too trigger happy. There may be some criminals in this neighbourhood, but most of these folks are just living their lives." 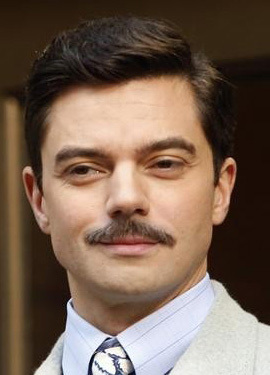 It's easy to forget given his current level of wealth and status, but Howard Stark grew up not too far from here. He reaches into a case and pulls out a handheld version of the contraption strapped to the car. He fiddles with both, locking in the frequency. Once he's got a fix with the portable device, he steps out of the car and points it towards the building. He sidles up to Peggy and murmurs, "Sixth floor, maybe seventh. Corner unit." Hey, it doesn't hurt to sweep all the floors. He could be wrong. But if he's right (and he usually is) he wants Peggy to be the one to bust down that door. He trusts her more than anyone else here. Well, except Jarvis. But he's no good at kicking down doors. "Wallet, inside pocket, Jarvis," he murmurs to his butler before he gets too far away. The toughs keep their distance when they see the weapons, but that doesn't exactly make them stand down. More and more people are stopping to stare or to circle. No one's getting too close, except the curious kids who run up to poke at the car. The building door itself has a crumbling staircase and a door that doesn't look like it latches properly. The lobby is small and there is no elevator. It's eight flights up. There's two stairwells, one that comes out at either end of the hallway on each floor. It smells of tobacco, cabbage, must and unwashed humans. The landings are populated with loitering teenagers. Women holding babies or men in wifebeaters with suspenders lean against doorjams and eye the intruders. No one asks why they're here. To Jarvis, Peggy smiles. "If we somehow find ourselves without our car, I am sure the upstanding members of the NYPD would only be too glad to provide us with a ride. Isn't that right, Detective…?" She glances at Det. Nelson. "I presume you are the detective in charge for the police today?" As Jarvis moves toward Rachel, she nods in thanks. "And don't worry, Mr. Jarvis, our own back up will be arriving shortly as well." That is, SHIELD back up. That taken care of, Peggy moves toward the building with purpose. "Yes, we are not here for the neighborhood, just a singular part of the building. Let us exercise caution and restraint." At the murmured response from Howard, she gives the barest of nods to indicate that she heard him. "I'll take the sixth floor," she tells the Detectives without an explanation as to why she wishes that one in particular. As far as she's concerned, she doesn't need to give one. It's clear she does not mind or take notice of the smell, but she does scan each person she crosses, determining threats and dismissing them as she sees fit. Jarvis, meanwhile, despite the occasional surreptitious and anxious glance back at the agents, approaches Rachel with a very slight, pleasant smile. It turns to an expression of brief confusion when he sees the marks on her face. Facial tattoos aren't exactly common, even in 1940s New York, particularly on women. Perhaps she's Maori? He can't think of any other people who have such markings, but he'd always understood them to be darker-skinned than the young redhead. "I beg your pardon, miss," he says. "Is it possible you're lost? It might not be wise to walk the streets alone." It's not that he doesn't know dangerous women. The most dangerous one he knows just walked into that building. He's just not convinced they're the norm. Hopefully there's more police coming, and they can set up a perimeter and watch the cars, Nelson thinks to himself. He could detail someone to stay for crowd control, but he wants to move fast, before anyone can get away. He looks askance at Stark's gizmo, but, well, this is a time of wonders, right? Yeah. Right. "Nelson, ma'am," he says to Agent Carter. "Frank Nelson. And I'm in charge for the moment, at least." If things start to look legit, he fully expects someone higher ranking to show up and try to take over, get the credit. When Peggy heads for 6 on her own, he frowns a little bit, then turns to two detectives with him. "Munch, Drebin, take five. I'll go with the lady on 6." It's one thing for her to look like she knows what she's doing. It's another to let her go alone. "Oh, silly old me. Sorry for causing such a fuss." Rachel smiles back at Jarvis, her head still killing her, "I'm having a terrible migraine and I really just need to get up to my apartment and lie down." She reaches a hand back up to her head and grimaces just a little as an idea strikes her, "Would you be so kind as to help me upstairs? If it's not a bother." The people in this building have seen a lot. They've seen hardship, violence, starvation. They've seen war and disease. What they've never seen is a man in bracers with shiny shoes and a wide tie waving a contraption around that looks like it came out of a pulp magazine. They've also never seen a woman like Peggy with a gun, leading armoured men. Howard whacks the side of the machine. It wheezes softly, then starts to click like a Geiger counter. "This whole building is saturated. The levels are rising quickly." He starts to take the stairs two at a time. He relies on the people with guns to keep up with him and cover him. The device starts to tick tick tick louder and louder and then, "AAAHHH!" a woman's scream echoes from the sixth floor. Peggy gives Jarvis one last glance before she moves inside. She trusts him to be able to handle Rachel and to follow them once he's able. There are enough police officers and her back up SHIELD agents should arrive at any moment that he should have some help should he get in over his head. The introduction from Detective Nelson is given a nod. 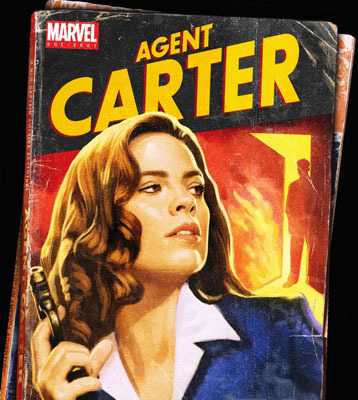 "Agent Peggy Carter," she returns. It's only polite. "That's quite alright, Detective Nelson. I have Mr. Stark's accompanimen—" However, as she is attempting to assure Frank that she doesn't need any back up, Howard is ignoring them completely and running headlong into what will most likely be danger. Though it's Howard's movements get her moving, the scream springs her into action all the more readily. Even in heels, she is fast, no longer interested in arguing with Frank about whether he can serve as her back up or not. "Get behind me," she orders as she moves with purpose toward the corner unit Howard had suggested before. Using her momentum, she plants one foot and then kicks at the door, right below the door knob. "Oh dear!" Jarvis manages to exclaim this really very quietly. He has some experience with migraines. Anna has suffered from them herself, and Mr. Stark's hangovers are things of legend. "Yes, of course, I would be glad to — "
He's just reaching out to help support her when he hears that scream. "…I do hope that's not your building, miss." Yeah, despite his reputation, or perhaps because of it, Stark doesn't impress Nelson as the best back up for a woman going into danger. And the Doodad he's carrying sure doesn't help the impression. When the woman screams, he reflexively draws his gun so quickly it's out and ready before he realize he's gone for it. And then Carter takes off. "Whoa! Just a dam—just a minute!" Now this just Ain't Right, a broad charging into danger like this, and Nelson's hurrying to catch up and restore things to their proper places, but -damn- she's fast, and then she's kicking at the door like she knows exactly what the hell she's doing. Better pay attention, Frank! he tells himself. The scream gives Rachel a sense of urgency despite the throbbing pain in her head, she didn't even know what life was like without her powers; it was like being normal? So this is how everyone else felt, not being able to read minds and do other crazy stuff. "Oh no! That sounded like it was.. my mother?" She does her best to sound concerned, because she was, it just wasn't her mother she was concerned for it was anyone inside, "Let's hurry please! Someone up there could be hurt, I just couldn't forgive myself if I didn't do something to help." She didn't think she would be able to get inside without Jarvis anyways, given the SHIELD agents and police. Howard knows to get out of Peggy's way when she means business. He stands aside and lets her charge the door. Even if she hadn't used a fair amount of force and proper technique, the door would have still buckled. It wasn't in the best of shape to begin with. So under the weight of her technique, it buckles like Captain America hit it and droops off its hinges. So the wood is rotten and thin. So what? It's still pretty impressive. "Whoah whoah, Peg, Peg!" Howard paws out at Peggy's back to try and pull the woman back. The reason for that is clear once she's over the threshold. There is a jagged crack along the floor and up the wall. It's glowing faintly green and pulsing softly. There is a woman's hand protruding from the crack. It's flailing and sinking quickly. Nearby, there's a broken plate with toast on the floor. Their radios crackle. It's Agent Thompson with backup. "Agent Carter, we're on our way. Three blocks to your location." Peggy gives no second glances for Detective Nelson or even for Howard as the door splinters open. She takes in the scene: green ooze, jagged crack in the floor, and a woman's hand quickly sinking. Though Howard is able to pull her back only for a moment, Carter shoves her gun at the inventor and dashes forward, hand outstretched for the woman who might still be saved. "Hold on!" she shouts as she weaves over the cracks on the floor. There's not much purchase, she tries to brace herself against the cracked wall and reaches right for the disappearing hand, not caring about the ooze. "Oh. Oh dear." Turning to face the building — and, in theory, protect Rachel from whatever terrible things might be happening — Jarvis, forgetting her strange facial markings and apparently just accepting that she lives around here, sprints toward the door. He does guide Rachel along with him as well, adding: "I'll keep you safe. Though really, it's very unwise to go in. The agents will surely be more equipped to help." "Jesus, Mary and Joseph!" swears Nelson as Peggy slams open the door. No, not at the sight of a dame knocking open a door, but at the sight of what lies beyond the door. What the hell's the 10-code for…what the hell is he even looking at? Oh, well he's looking at a broad throwing herself into troub—right. Tossing his gun to his other hand, Nelson goes after Peggy, not knowing if he's trying to save her, or help her save whoever's disappearing into the crack. "Hold on!" Lying was not Rachel's strong suit, not without the aid of mental powers at least. It takes her a moment to realize that Jarvis is helping her along to the building, doing her best to keep up with him in her heels as they click-clack on the pavement. She smiles up at the taller Jarvis as they head inside, "Thank you, you have a very reassuring presence and you're also very kind." She does whatever she can though to quicken his pace upstairs, removing her heels when they reach the stairs themselves. The hand that Peggy manages to grab hold of is cold and going rigid. It has enough power to grip on to the other woman. In fact, it grips with a great deal of strength. It starts to drag Peggy back, down over her wrist. Only the clasp of her watch stops the hand from slipping off entirely. There are no more screams. In fact, there are no sounds at all. It's like the room has become a sonic dead zone. Howard looks from his device, to Peggy, to the gun that's been thrust into his hand. "Goddamn it, Peg! Let go! It's going to seal up any second now!" The floor (and Peggy's shirt, and Nelson and Howard's shoes) are covered in that strange green substance. Their radios crackles again. "Agent Carter, this is Thompson. What's your status?" He's a pretty steely guy, but worry has creeped into his tone. At the sudden yank, Peggy almost falls straight into the crack even bracing against the wall as she is. If not for Frank's timely grab, she would have tumbled forward and befalling the same fate as the poor woman that is grabbing onto Peggy's watch. Feeling the cold, going rigid hand, the agent frowns despite the danger she's found herself in. "I'm sorry," she sighs softly to whoever this person was. She'll be sure to find out once they're in the clear. Then, louder, she informs Frank, "Detective Nelson, I have to let go of the wall. Hold on!" She gives him a moment to process that before doing just as she says, leaving the brunt of keeping the both of them on this side of ooze central squarely on Detective Nelson's shoulders. Fighting against the enormous force pulling against them as best she can, she fumbles with the clasps of her watch in the attempt to loosen it and therefore the hold the hand has on them. "And for Pete's sake, Howard, would you tell Thompson we're a little busy at the moment!?" The comment strikes Jarvis as a little odd — not that he isn't a kind, reassuring man, but people rarely actually just come out and say so. But he marks it down as the poor woman's head aching fiercely. Perhaps she's overcompensating into immense sweetness. He guides her into the building and upstairs in any case, adding: "Really, we should wait outside. It would be wiser." He considers the men he saw loitering around the building, though. "…Possibly." Up the stairs they go. Nelson's tucked his gun into a coat pocket to free up both hands, bracing himself at her warning. "Ready!" he calls out to her. In the face of the bizarre, he's falling back on what he know he can deal with, and at the moment that's keepign a woman from falling down. No problem. He shifts his posture a bit, searchign for a more secure position. Rachel had seen some old movies and she had a feeling she was doing an awful job, but she had to improvise. At least the compliments weren't a lie, like the thing about the scream being from her mother. "Safe isn't always interesting though, is it?" As she hurries up the stairs bare-feet, she attempts to make some small-talk with Jarvis, "I'm Rachel by the way, I don't think I caught your name, Mister?" She's scrambling as fast as she can to get up there, although she isn't sure what she can do to help, "We're almost there!" Next stop Sixth Floor? It's lucky for Peggy that the fingers froze up curled around her watch and not her wrist. Releasing the clasp does indeed release the death-grip hand. Once the hand is free, it slips back into the glowing crack. They will have to scramble back quickly to escape the rapidly closing crack. Once the crack has sealed, there's nothing but green ooze and the residual energy like they found at the other scenes. That, and a very quiet little apartment. The woman didn't live alone, from the looks of things. There's a man's hat hanging on the back of the door. There's two mismatched chairs at a small table. Somewhere, there's a man who doesn't know he's a widower. Howard stares for a moment, but it doesn't take the scientist long to leap into action. He grabs for his radio and barks into it, "Thompson, get up here. Sixth floor. We've had an incident. The rest of the agents need to keep the situation calm. We're about to have some very scared people in this building." And in a tight-knit community like this, that fear could easily turn to anger - anger that could be turned against anyone in authority. Frank's grip holds and Peggy's able to get the watch loose in enough time. The sudden pull gone, the pair fall backward. Luckily, it's away from the cracks and the floor. "Come on!" Now keeping a grip on Nelson, she doesn't bother to get up, instead sliding along the floor as quickly as possible to ensure neither she nor Frank fall into the crack. Once it's gone, she takes a few deep breaths, looking about her this way and that. "Thank you Detective Nelson," she tells him quite sincerely as she picks herself up, eyeing the green ooze that is now all over her clothes. "Howard, what was that?" Barefoot. The woman is barefoot now. She must not be used to heels — how is that even possible? "Jarvis. Edwin Jarvis. I say, Miss — " She just gave her last name. "Miss Rachel, I really must insist you let me go ahead of you. There may be great danger." And when he hears familiar voices above — and some shouting and struggling — he does go sprinting up those stairs, making the best use of his long legs. Detective Nelson somehow keeps hold on Peggy, and when the pulling on her hand is gone, his effort sends them backwards rather inelegantly. "Damnation!" he grunts on impact. Following her lead, he basically backstrokes across the floor, trying to get clear of that…that thing, with his hindbrain thinking only of keeping away from the lion trying to climb the tree. "If I never see anything like that, it will be too soon," he says, still laying on his back on the floor. Running in heels was a sport all on its own, running up stairs in heels? Rachel was just not into that kind of hassle, slipping and falling, a heel cracking; anything could happen, "Pleased to meet you Mister Jarvis." The niceties of the introduction in this era had not been a strongpoint, she then adds, "My last name is Grey." Her mother's name, quickest thing she could think of. Keeping up just behind Jarvis as the man hustles up the stairs, she asks, "Are those your friends up there? Usually, Howard has an answer for these things. He knows so much about so many topics. Even when he's not sure, he usually swaggers his way through. Still, some things defy even his genius-level of swagger and bullshittery. He looks down at his device, then up at the green ooze on the floor. "I have about five guesses. Three of them defy the laws of thermodynamics and two defy the laws of spacetime. In any case, all of them require rewriting some fundamental physics to be possible." Is that a drop of sweat on his brow. Ahem. A pair of cops have positioned themselves at the base of the stairwell. There's a crowd of residents that's grown in the hallway. They're keeping everyone back, including Jarvis and Rachel. They were riding in the other car, so they don't quite realize that Jarvis is one of the team. "Are you alright, Detective Nelson?" Taking in the scene, Peggy frowns. There's few clues here, from what she can tell, but she starts to case the scene anyway, just in case there's soemthing she's missing. It's not a large room, so she can spare a sideways glance for the wayward detective from the NYPD. While this has been like nothing she's seen before, she's no stranger to to the strange. "Well, get started on it, then. People keep disappearing and we have to figure out why these people and how it's being done. There has to be an explanation to it." Her voice hold barely constrained anger. She felt that woman's hand, felt it grow colder and then had to let go. Of course, there is the more business-like side of things to be done. As she notices Jarvis in the crowd being held back, she gestures for him to be let through - it's up to him whether that includes Rachel. Once she's finished studying the room, she takes a breath and calls on the radio, "Thompson, I want the people in this building interviewed. There has to be a clue here somewhere." It does not include Rachel; at least, Jarvis isn't helping her come through. "Miss Grey," he says, "please remain here. I think — yes, you really should stay here." He moves through the crowd, rather concerned given all the noise that the poor woman's mother might be in a state Rachel shouldn't see. "What on Earth has happened?" "Fortunately, none of those laws are ones that I'm sworn to uphold," Nelson says in Stark's general direction. He sits up gingerly. "I'm upright and breathing, Agent Carter." It's the first time he's addressed her by her title, and there's genuine respect in his voice. He then stands up and starts to absently brush…gunk off his suit. "If you'll excuse me, I'll go downstairs and coordinate with the uniforms," he says. He glances at Jarvis and Rachel, passing them by on the way out, does a double take at Rachel's facial markings, and then gives a shrug. Helluva day when a face like that isn't the strangest thing he's seen. Rachel wasn't about to be left behind with the crowd of people and potentially be stuck on her own trying to figure out what was going on. She does her best to keep behind Jarvis as he moves through the crowd, telling him, "I'd feel much safer with you, besides, you're going to need to question me right? Since, there's no way you believed that lie. I just want to help." She hadn't even believed the story about her mother and her confession she hoped, would pique Jarvis' interest enough along with the tattoos that he might consider allowing her to help. She would definitely need a better cover story. Thompson soon arrives, along with a carload of agents. Other NYPD show up, and the scene is promptly secured. As Peggy ordered, the various authority figures start the process of interviewing everyone in the building. Not unexpectedly, many refuse to talk. Others require translators. What they're able to determine was that the apartment belongs to a young immigrant couple from Sweden. Enga Tjeder worked as a seamstress, while her husband, Michael is a delivery truck driver. Michael was on a shift when this…phenomenon occurs. He's intersected by the agents and taken away to be questioned and looked after. As far as the analysis goes - well, the only new piece of information they have is that this is far stranger than they thought. Howard is, quite frankly, stumped. The only thing they can do is try and stop another person from being swept through a rupture. But for now, his machine shows no signs of new readings.